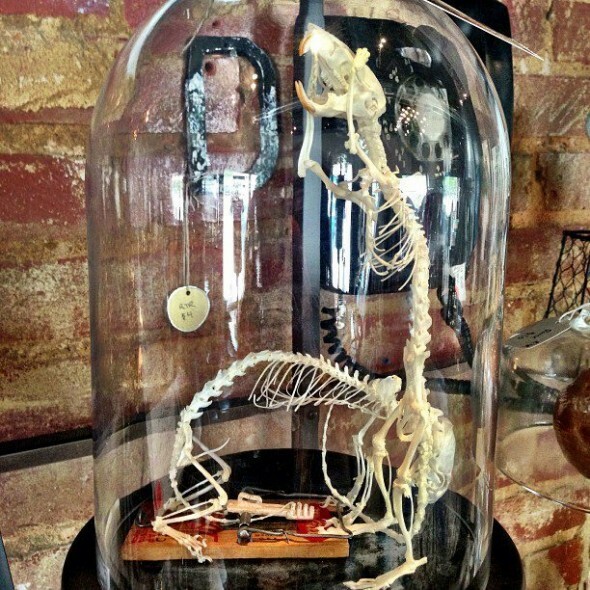 A few weeks ago I spotted curious objects trapped under glass. I’d been at the Better Block OKC event in the Farmers Market District. While I didn’t have plans to purchase anything beyond a few items for my children, I did end up carrying home a little something for myself. You see finding The Shaman, as I like to call him, was a little bit like falling in love. Such was the pull with this creature of fascination. Pictured below, the Shaman holds in his little paw a tiny mound of dirt, which falls in three strands between his boney fingers. On his hip rests a leather belt, a tiny knife with a razor’s edge is sheathed in it. The Shaman’s other paw rests upon the handle. The level of detail continues down the curve of the Shaman’s tail, which wraps around a steer’s skull. If you take a closer look, however, you’ll see the steer skull is actually a composite piece. It’s a slightly bigger mouse skull with armadillo scales added to it. Another bone, perhaps from the ribcage of a larger animal, functions as its horns. Naturally the level of detail and creative use of found organic objects had me hooked, but what really sealed the deal was that the whole piece had a name and a little bit of back story, which is to say there’s just enough background story to give you ideas, but not too much to completely overwhelm you like a ridiculously long fantasy novel. So The Shaman in “Dustbowl” appeared to be perfectly encapsulated in a little world unto himself. But that could easily be said of all Brian Magby’s skeletal articulations. While each piece tells a unique story of its own, what they all have in common is that they’re a bit quirky. Photo via The Salvage Room’s Facebook page. After a brief chat with Brian and Stephanie Magby that day, I picked up their card and made it a point to find out more later. As it turned out Better Block OKC’s arts market was their first time selling from a booth, previously they’d only listed pieces online and stocked a few at The Salvage Room. Now if you’ve been to The Salvage Room in the Plaza District, Brian Magby’s art should be a familiar sight. Another fact that won’t come as a surprise to anyone who’s been following his art is that it sells quickly. I didn’t know any of this before our official interview almost a week later. All I knew was that I had to have “Dustbowl” on my desk and the thought of The Shaman ending up elsewhere was not an option. I’m guessing anyone else who has one of these pieces knows exactly what I mean. 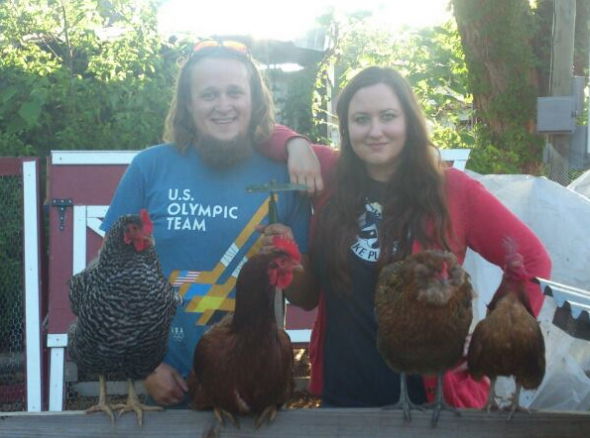 Brian and Stephanie Magby and their flock of chickens and roosters. Not all are pictured, but the flock consists of Bantams, Americanas, Rhode Island Reds, Barred Rocks, Silkies, and Cornish Rocks. The Cornish Rocks are for meat, although I’m told by Brian and Stephanie that this is their first time to raise chickens for consumption. To see where the magic happens, I headed out to the Magbys’ house for the interview. On the way into their neck of the woods I noticed there were houses up on house-moving palettes. 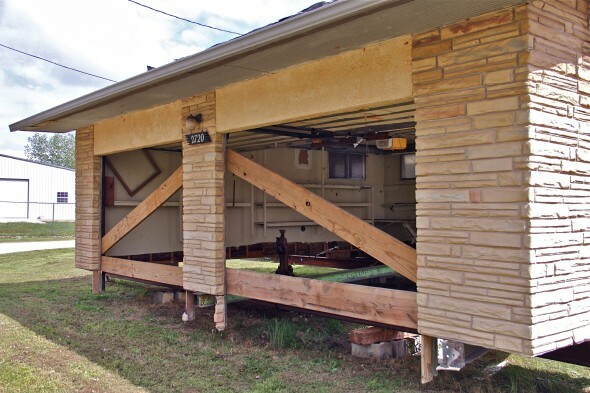 Some structures were gutted and the garages of others were detached. I know people will pay to have houses moved, but seeing a few grouped together was a bit different. I made a mental note to ask about it later and proceeded to walk up their drive, where I was greeted by Stephanie and Brian, who at the time were tending to their chickens. I was treated to a tour of their garden, chicken runs, and houses before we moved into Brian’s studio space. Someday someone is going to purchase this either to restore it or repurpose it. It is important to note that farming and sustainable living are important to the Magbys. As we talked about the crazy Spring weather that took its toll on their garden this year, I learned that the Magbys got into urban farming in 2008. It wasn’t till 2010 that Brian began creating the mouse articulations. He works for Economy House Moving Service Inc. part-time now, but back then the job afforded him the opportunity to come across a perfectly complete mouse skeleton. And those gutted out houses I saw on the way in? Yep. Part of the Economy House Moving Service Inc.’s stock. To put it into perspective, it’s only natural that the job would prove to be an ideal one for finding animal bones. Even so, finding complete skeletons is not as common as you’d think. Brian’s work space is a world unto itself. On one table his supplies and tools are neatly divided into containers, while another table holds the glass domes that seal in the articulations as well as a few finished pieces. 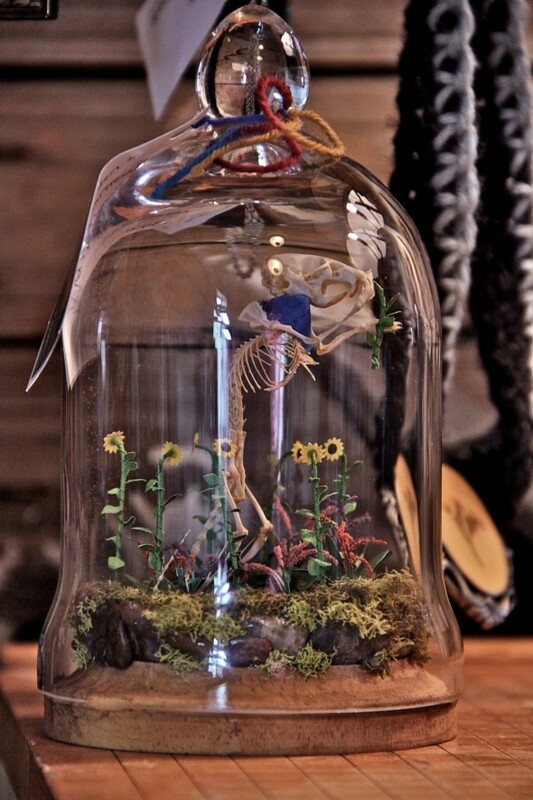 On that table you’ll also find a tree limb display where found object and bone jewelry hang. Brian said he doesn’t really have a detailed plan of action when he sits down to assemble an articulation, rather he lets ideas come to him and evolve as he builds each one. In doing so, characters begin to emerge and their stories develop. Eventually the piece gets a name. He said it takes many hours just to assemble one skeletal articulation and that at this point it is starting to become a full-time job. Especially since his pieces tend to sell quickly. Also factor in that the bones aren’t always easy to find as a complete set, so there is time spent sourcing them locally or purchasing them on the Internet. Note: the skeletons are animals that have died of natural causes. Brian outlined what it is like to go looking for skeletons, and how it is often hard to reassemble the bones of an animal. Rarely do you find them grouped together as bugs and other natural forces have a way carrying bones off, even so, when he does find them most of the time they’re old and don’t need a lot of cleaning. When he does have to clean them, a peroxide solution is all that is required. So what does one listen to when assembling art for hours on end? I’m told: NPR, Old Crow Medicine Show, and Edward Sharpe and the Magnetic Zeroes. I asked Brian if he was into zoology and anatomy as a kid and as it turns out: not really. He said he spent a lot of time roaming his grandparents’ land and skeletons weren’t in the picture yet. Rather, if he wasn’t playing out in nature, he was at his house fort. He even built himself a garage for it. This is a skill that’s developed into his other part-time occupation right now, which is building a real house out in Weleekta. They were able to purchase the land in 2012 and have been working towards getting it ready for habitation this year. Ultimately the Magbys plan to move out to their property, Undeveloped Area Farms, and form a farming co-op with another couple that are close friends of theirs. Both families have purchased land near each other with the idea that they’ll help each other farm, raise animals, and eventually sell preserves and other goods. Brian said one day he’d like to start an aviary with finches and other small birds that are securely enclosed in a netted grove of trees. 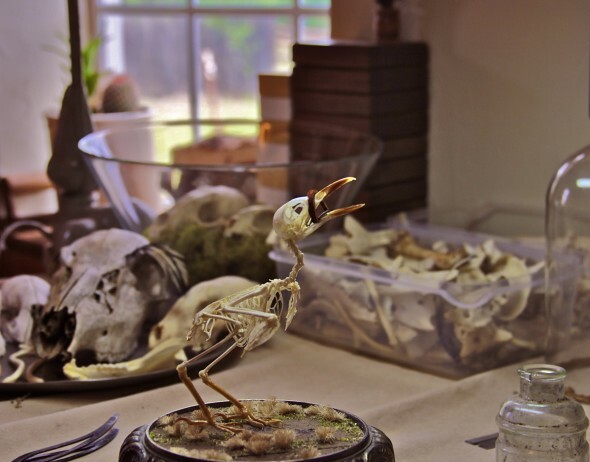 When the birds naturally pass away, he would start collecting their bones for new skeletal articulations. Through his developing his art, Brian has learned more about anatomy and how to work with limitations. While mice skeletons are small and light, and therefore don’t need wires, larger animal bones require more structural support. He said there is sometimes a bit of challenge in posing animals as if they were little humans. 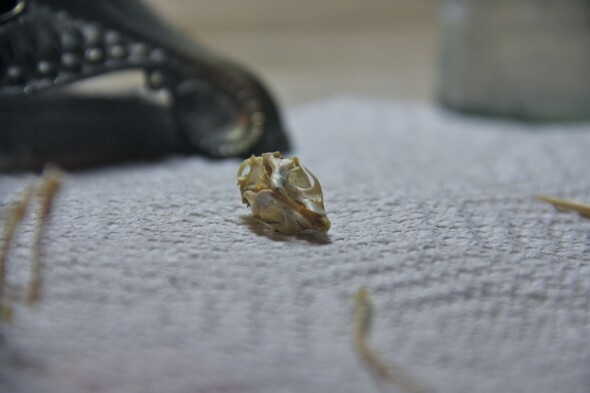 This mouse skull will be paired with a body, which will then ride off with a spear in hand on the back of the finch. Brain said the time spent making art is quite fulfilling. His first skeletal articulation, a mouse in a top hat holding a porcupine quill cane with a mimosa on a side table, sold to two older ladies from Chickasha. 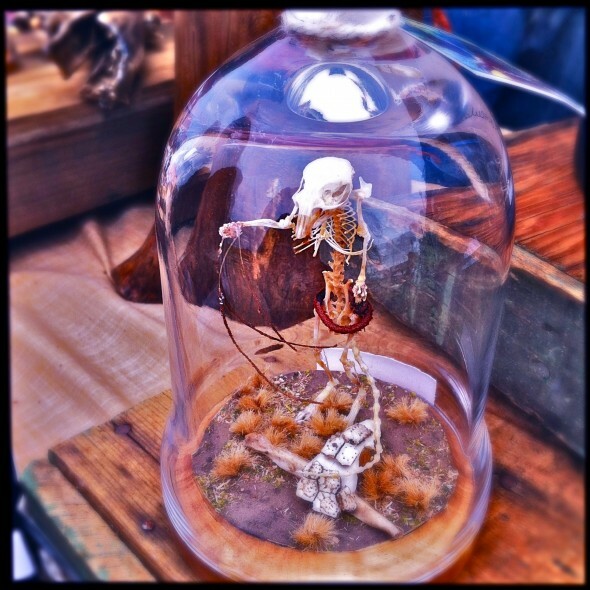 Since then many more people have purchased these quirky organic curios. Brian said he’s tried many things in the past, but he’s happy to find success in this and that it has enabled him to start shifting away from the house moving business. Stephanie works full-time, but is excited that they are making progress on their goals. If you’d like to check out what they have for sale, there is their Etsy store and also stopping by The Salvage Room, 1714 NW 16th St. OKC, OK 73106. You may also find them at future festivals that feature arts markets. As word travels about Brian’s unique mouse articulations, they’re finding new opportunities to show off what they have. 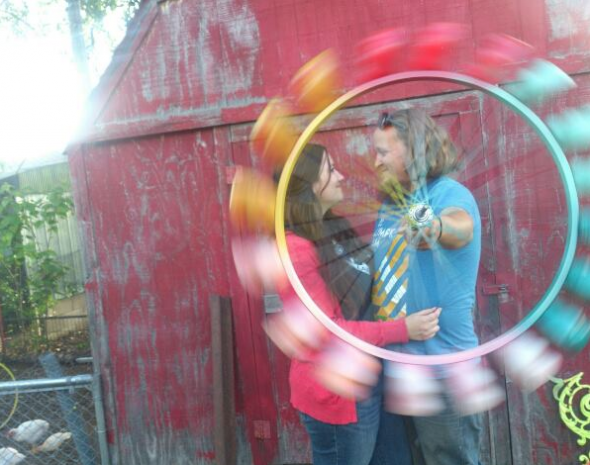 Not to gush, but Brian and Stephanie are probably the sweetest and most creatively resourceful couple I’ve met since the start of this year. That’s a bicycle wheel with spray painted two liter bottoms attached, which they’ve turned into a kinetic sculpture, that when not being used as a prop for this picture, hangs out on the porch catching the breeze. Tagged animals, ART ✍, Artist Brian Magby, Barred Rocks, Brian Magby, chickens, Economy House Moving Service Inc, Edward Sharpe, Etsy, farming, Indonesia, Instagram, interview, OKC, Oklahoma City, The Salvage Room, Undeveloped Area Farms. Bookmark the permalink. Great story. It is nice to see people making this work in Oklahoma. I wish there was more of it.